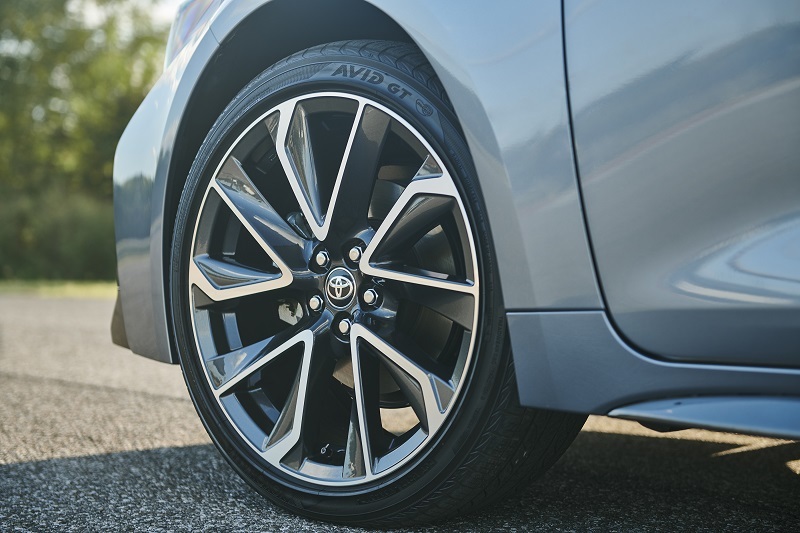 Toyota debuted their latest – 12th generation – 2020 Toyota Corolla Sedan earlier this month to a global audience. A true world car, with over 45 million sold globally since 1966, the reveal was from China with participation by a selected group of U.S. media in Carmel, CA. 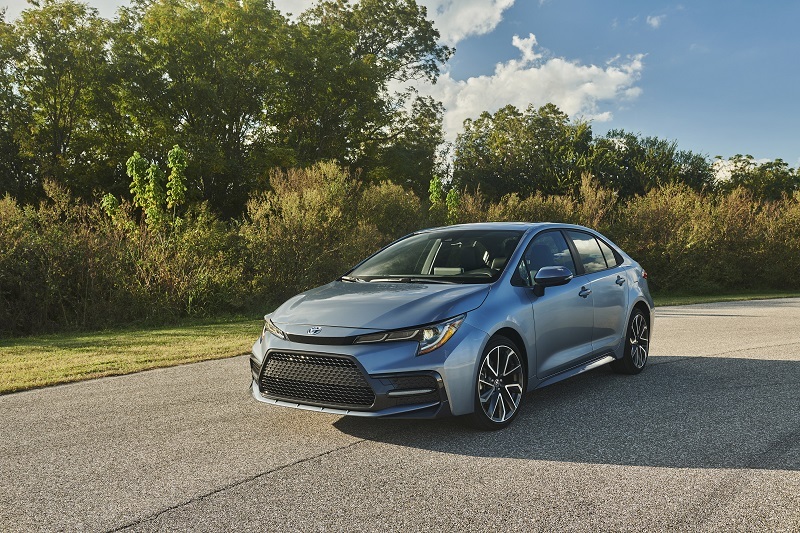 Slated for arrival in dealerships in Spring 2019, the new Corolla Sedan joins its sibling 2019 Corolla Hatchback to offer two distinct versions of the well-equipped and refined yet sporty compact for discriminating buyers. Built on the Toyota New Global Architecture (TNGA) platform and offering three engine choices, two transmissions and plenty of media and technology – it looks to be the best Corolla sedan yet. New styling gives it a lower and leaner profile that hints at a new agility. Sculpted fender flares and larger wheels suggest driving dynamics typically not found in a traditional compact sedan. Corolla’s front fascia’s vary by model grade. The SE and XSE trims feature a body-color chin spoiler, aero stabilizing fins and contrasting rocker trim panels that emphasize the new wide stance and sporty look. 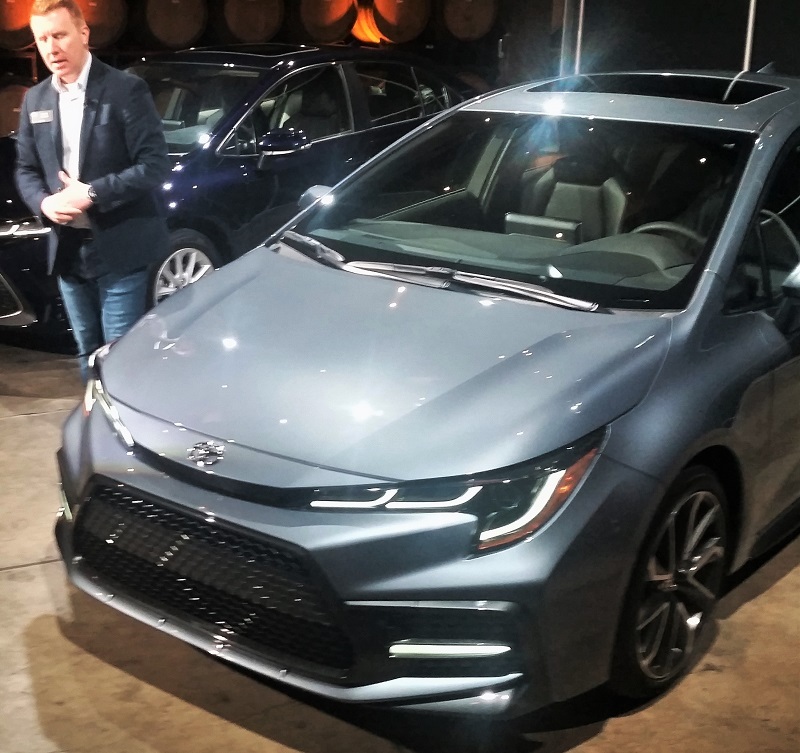 All 2020 Corolla sedans use LED lighting. Slim, J- shaped Bi-Beam LED headlamps sit deep in the front fenders to give SE and XSE models a distinct nighttime signature. The sportier SE and XSE grades use triple J-shaped clearance lamps with LED light guides that, along with LED turn signals, create a unique design signature. At the rear, a narrow combination of lamps wraps deeply into the fenders offering a similar varied yet distinctive looks. The SE and XSE models sport a small rear spoiler and exposed tail pipes. 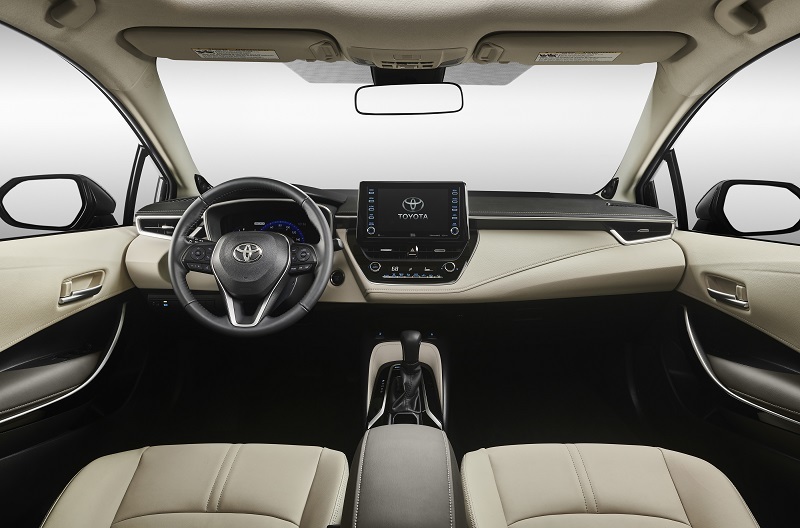 The cabin of the 2020 Corolla is significantly improved in feature, function and comfort. We noted more comfortable supportive seating with upscale fabrics and nice use of both soft and hard touch materials on cabin surfaces. High-gloss materials and piano black coupled with matte elements, silver accents and contrasting stitching deliver a functional premium looking ambience. The instrument panel features a bright center stack display screen with functional access to vehicle settings, audio controls, navigation and Entune Apps. Climate controls are located just below for easy access. Other controls are logically-placed with minimal gaps for ease of use. We also noted the convenient placement of terraced cup holders that adapt to various-sized beverage containers. Available ambient lighting illuminates the front door trim, console tray and front cupholder. The console tray can hold small items such as a smartphone and functions as the optional Qi wireless device charging pad. 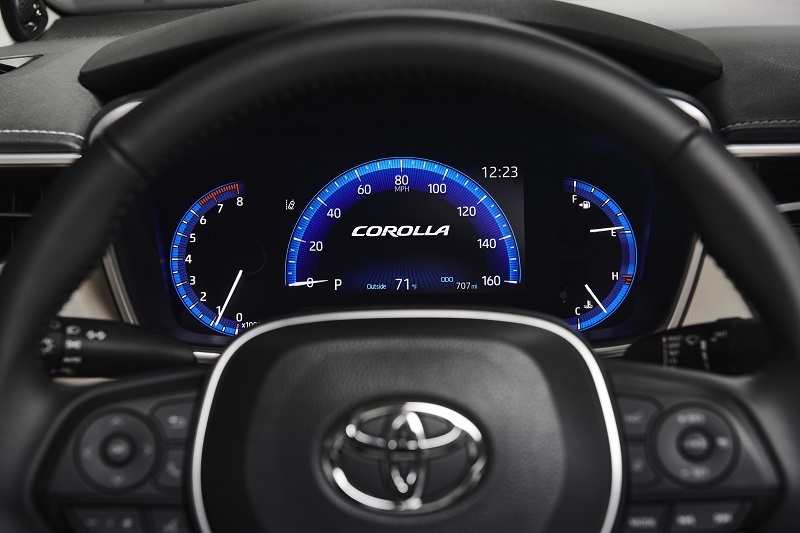 Corolla’s Instrumentation is by a standard 4.2-inch high-resolution Multi-Information Display or an optional 7-inch that switches between analog and digital speedometer settings. We liked the new front seating offering a sporty new design on XLE and LE grades with a unique shape with a headrest nestled into the shoulder area, while the XLE and LE grade seatbacks have a new U-shaped pattern. The SE and XSE grade front seats have broader and thinner shoulder supports overlapping solid side bolsters much like competitive bucket seats. Seating schemes and materials enhance the more premium look of the surrounding cabin. They include standard cloth or Softex in the higher grades. New color schemes include several striking two-tone accents including Blue/Black, Moonstone and new Macadamia. Checking the trunk – unable to measure for sure, it looks like several golf bags would fit side by side lengthwise in the wide and long space. 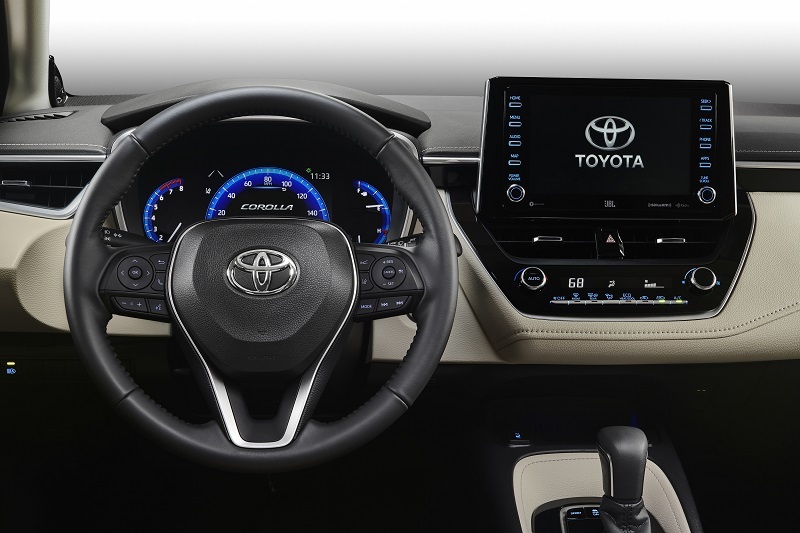 The 2020 Corolla Sedan comes standard with Entune 3.0 Audio. It features an available 8-in. touchscreen (base L is 7-inch) with USB port, six speakers; Apple CarPlay compatibility and Amazon Alexa. Android Auto is not available. Entune 3.0 Audio Plus is standard on XSE, XLE and optional on SE CVT. 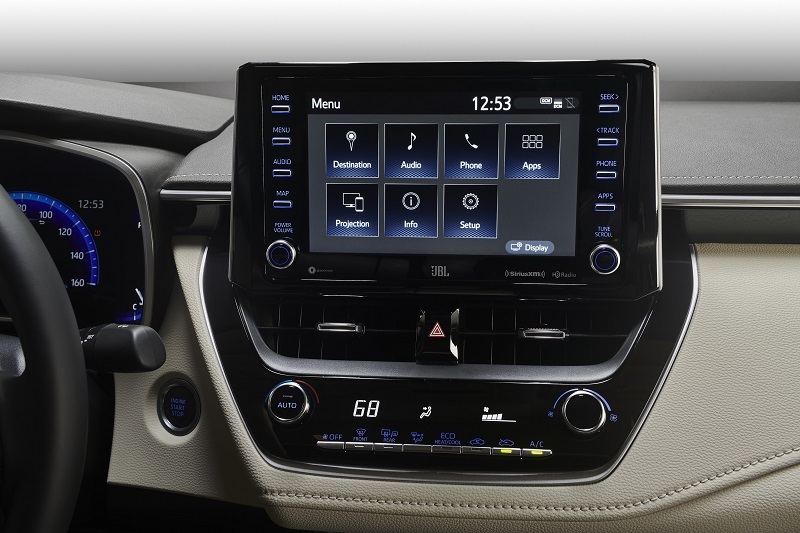 It adds an HD Radio and Weather/Traffic info; SiriusXM with Cache Radio; Entune 3.0 Connected Services; Service Connect, and Remote Connect. Also available on the SE CVT is Entune 3.0 Audio Plus with JBL. For serious multi-media types, Entune 3.0 Audio Premium is optional on XSE and XLE. It includes a JBL nine-speaker, 800-watt system with Clari-Fi; Dynamic Voice Recognition; Dynamic Navigation; Dynamic Points of Interest Search; and Destination Assist Connect. 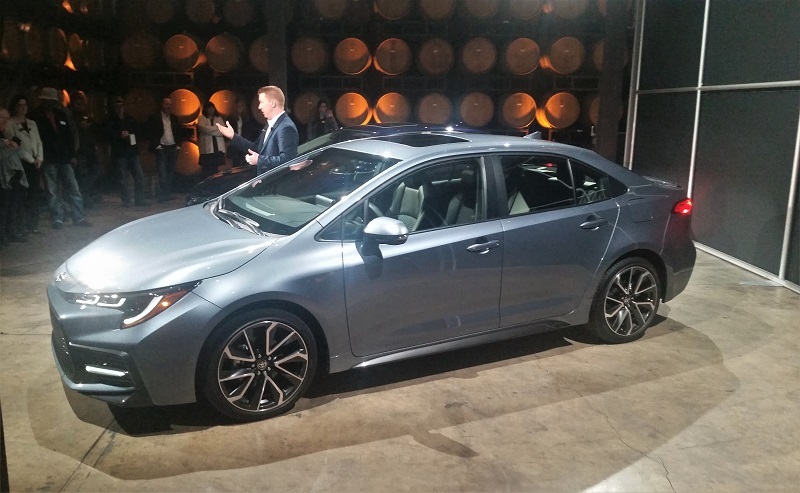 The 2020 Corolla will offer two distinctive power plants at launch with (yet to be announced) hybrid to come later. 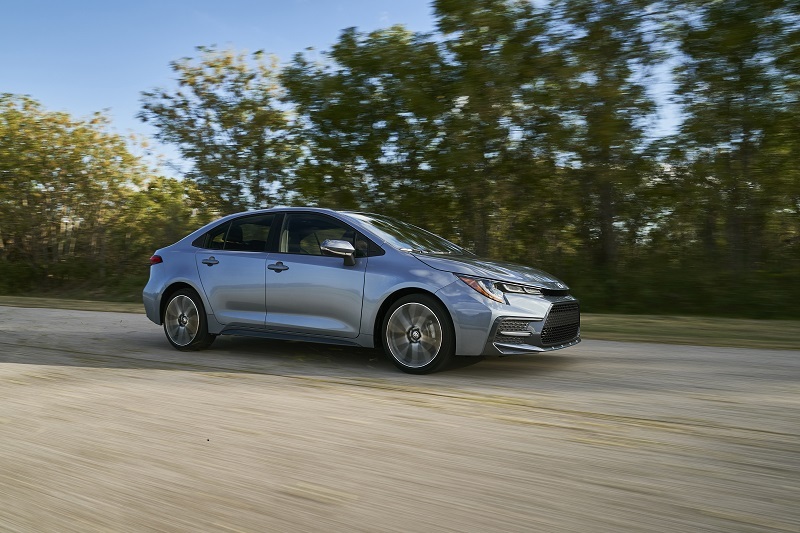 The 2020 Corolla sedan L, LE, and XLE grades will use an enhanced version of the 1.8-liter engine found in the previous generation, but now with more horsepower (increased from 132 to 139) and better fuel economy according to Toyota. 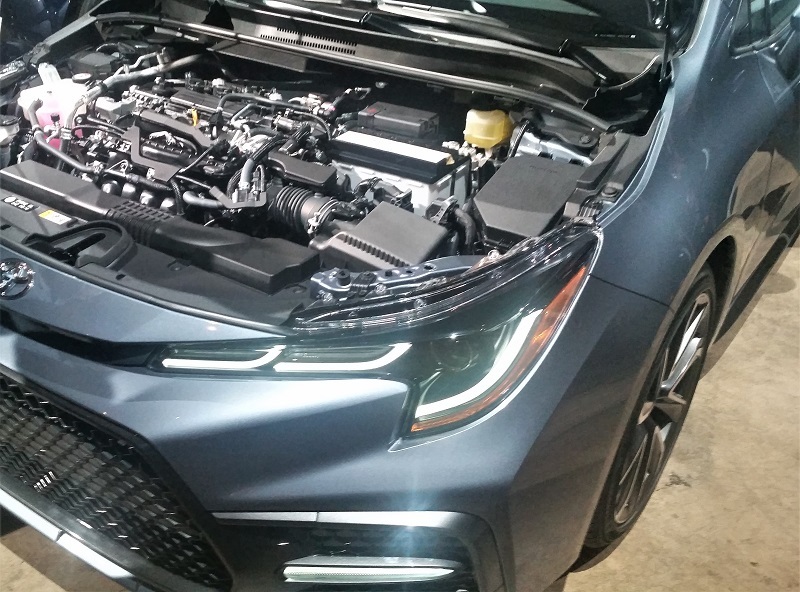 The brand new 2.0-liter four-cylinder engine powering the 2019 Corolla Hatch also powers the XSE and SE grades. It delivers 169 horsepower with 152 lb.-ft of torque and also delivers improved fuel economy. 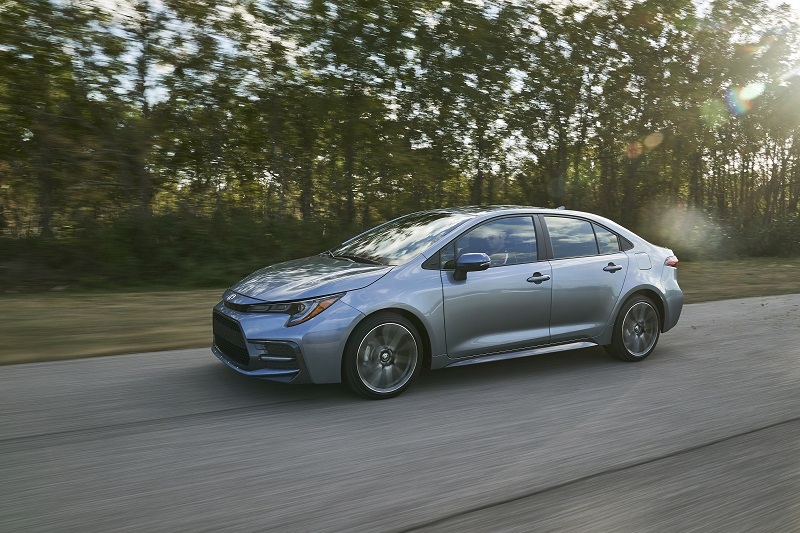 As with the 2019 Corolla Hatch, the Dynamic-Shift CVT (continuously variable transmission) will deliver the fuel-efficient performance of a CVT with a more direct driving feel of a traditional geared automatic. The Direct Shift CVT features a physical first gear for quicker start-off acceleration before transitioning to the CVT system. The CVT has simulated a 10-speed Sequential Shiftmatic with Sport Mode that provides a conventional acceleration feel. Also available is the new 6-speed iMT (intelligent manual transmission) already available on the Hatch. It features downshift rev-matching control and has new control logic that improves acceleration. Both transmissions are equipped with Hill-Start Assist Control. 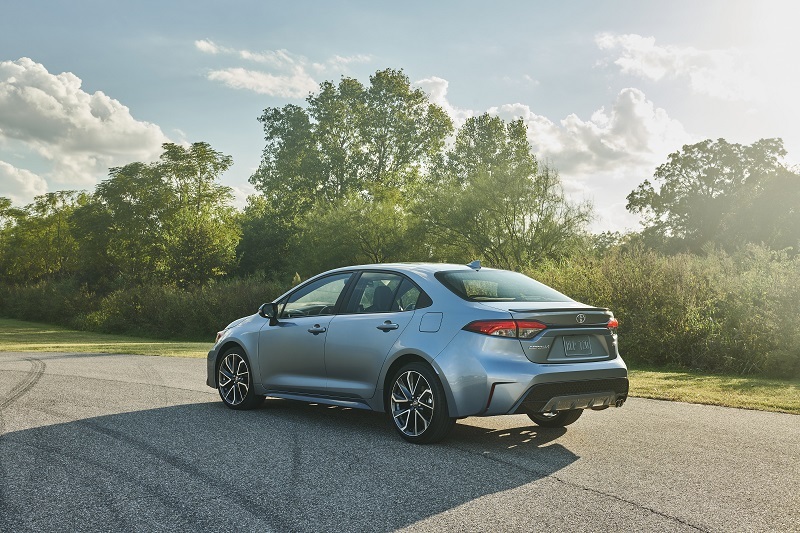 The Toyota Safety Sense 2.0 advanced suite of integrative active and pre-collision features are standard on all 2020 Corolla Sedans. Some of those include Automatic Emergency Braking, Automatic High Beams, Road Sign Assist, Adaptive Cruise Control and Active Lane Control. Blind-spot monitors, Brake Hold and Rear Cross Traffic Alert are optional or standard, depending on the trim level. How good is the new Corolla sedan? The proof – of course – is in the driving. When we get some wheel time, we will give you a further report. 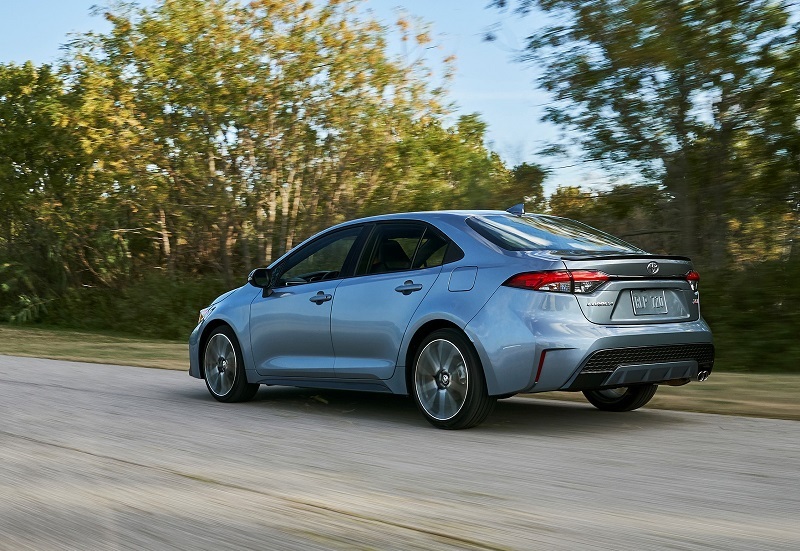 The 2020 Toyota Corolla will be built initially at Toyota Blue Springs, MS (TMMMS) with 2020 models arriving in dealers Spring 2019. Production will shift in 2021 to the new Mazda Toyota Manufacturing U.S.A. Inc. (MTMUS) being constructed in Huntsville, AL. The new plant will employ upwards of 4,000 at full capacity of 3,000 vehicles annually. MTMUS will be jointly operated producing the Corolla and a – yet to be revealed – Mazda crossover. 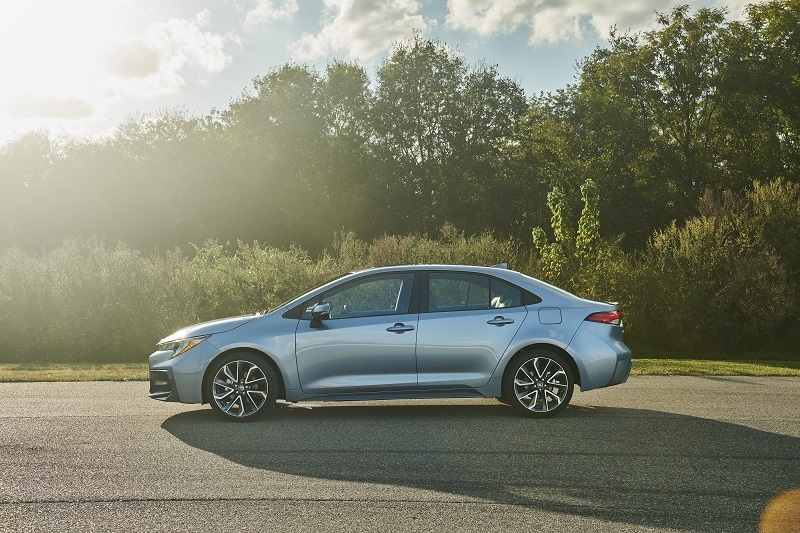 As noted, the new 2020 Corolla Sedan follows the introduction of its sibling the 2019 Corolla Hatch which arrived at dealerships earlier this year. Read more about the Corolla Hatch and its pricing by clicking on the two links below.